I bought a spinning wheel! I drove down to Frankfort, KY to The Woolery take an intro to spinning class and pick a wheel. I was surprised that the wheel I fell in love with was the Lendrum, because the thing looks too mod and silly to me. But of the five or six wheels I treadled on, it was very clearly my favorite. The class was great. Since I already know how to spin on a spindle, the first hour of class wasn’t entirely necessary but it was good to spin with an experienced spindler right there to help me with the nagging issues I’ve been having. The instructor Nancy was incredibly helpful, and I’ll be going back for her intermediate spinning class at some point. They didn’t have the Lendrum wheel in stock (which was probably a good thing – I had other things to do today when I got home!) but I should get one in my grubby little hands in a couple weeks. I just checked my Ravelry page and I have been working on this Nuvem wrap for over a year. It has been an active WIP that whole time, and it is stockinette in laceweight yarn. The pattern is written in terms of percentages and you make a ruffle when there is 20% of the yarn left – for this project that’s 40g. I swear on all things wooly, the other day I had 106g left to knit, I sat down with this thing for about an hour and a half and when I weighed it again, 109g. What have I done to offend the knitting gods this time? The Yarn Harlot’s post today is about being alone in the house and using loneliness as a positive force. It’s funny how relevant that post is to me today – my boyfriend left for a three-month workshop over the weekend and I find myself alone in our apartment for the first time since we moved in together. In the past year that we’ve shared a place, we’ve inadvertently picked up some bad habits and/or amplified preexisting ones. For example, we ended up eating out way too much because as long as either one of us suggested a restaurant we ditched the kitchen and went out. So we vowed to make this time apart helpful and effective for us. We are both supposed to be creating new, healthy and productive habits while we are apart so that we can start fresh when he gets home. But in the five days since he’s left, the apartment is still messy, I haven’t worked out, my to-do list is probably even longer than it was, all my knitting and spinning WIPs are still half done, and I still spent my pocket money on chocolate. I was really trying to save that for, I don’t know, vegetables or charity or something. Please don’t laugh, but I think I didn’t realize that I was going to feel lonely when he was gone. I was so looking forward to having the apartment to myself that I didn’t take into account that an empty apartment means that bf isn’t there. Having travelled across continents by myself I feel rather silly feeling alone in my own hometown, but there it is. 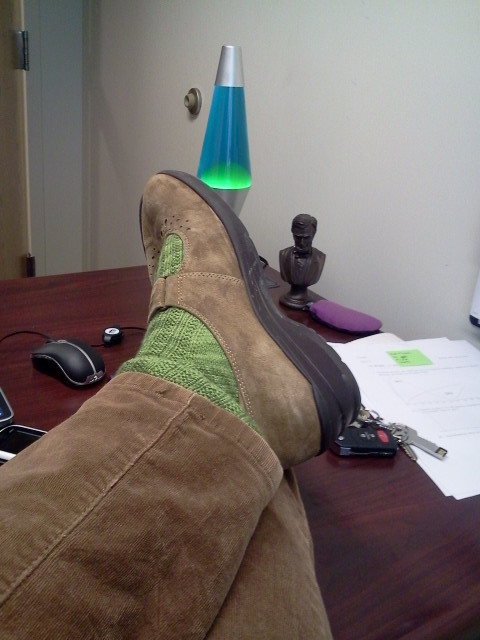 So today, one step at a time toward efficient, happy, productive bad-assedness. I’m updating the blog and have eaten a healthy breakfast and lunch. Maybe I’ll clean my apartment tomorrow. Huzzah! I went to my best source of fibery info – Ravelry – and found this old thread. 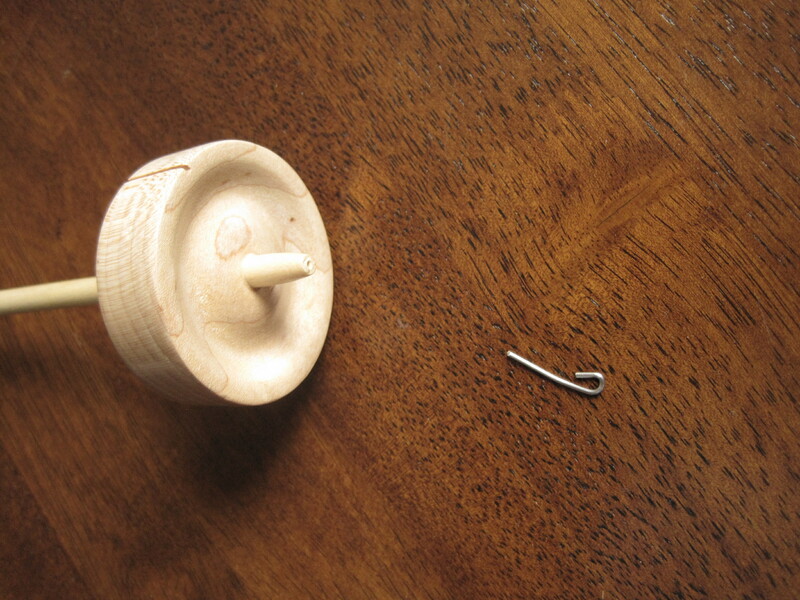 Following the suggestions there, I bought some Gorilla Glue and fixed my spindle! Feeling so accomplished. 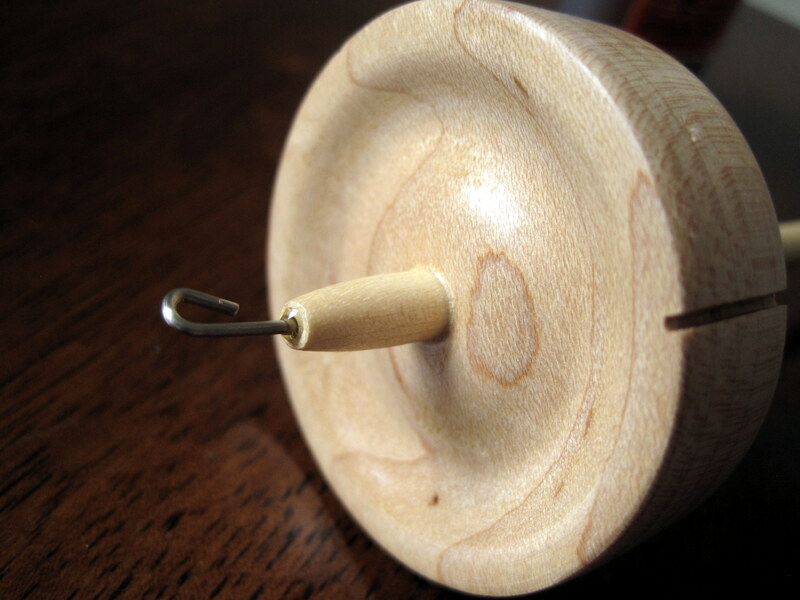 I’m already spinning a new batch of singles on this trusty spindle. 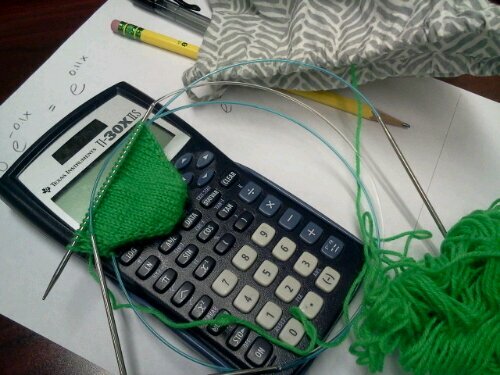 I’ve joined both a stash reduction group and a “spin X skeins of yarn in 2013” group (for me, X = 12) in Ravelry. When I count my blessings, I include my partner’s delight in my hobbies. He doesn’t do anything crafty himself, but he loves that I do, and he’s interested enough that I’m secretly worried that one day I’ll come home and find him casting on with my best sock yarn hehehe. 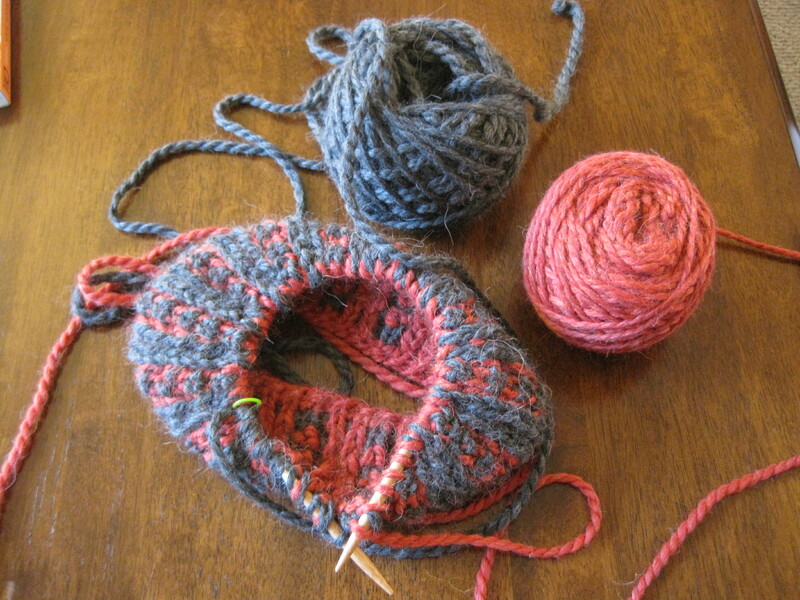 I used Cascade 220 and by now, after two winters of hard use, it’s a bit pilly and I told my man that it was time for me to knit him a new hat. He told me I could go ahead and do so, but he would still wear the original so he didn’t see a point in my effort. Ok, that’s one thing off my to-do list I suppose. So, you can imagine how much he freaked out when he lost his hat last week. Besides the emotional trauma, it was quite cold for Cincinnati and we walk about 1.3 miles to work each day. As soon as we were sure that the hat was indeed lost, I entered Emergency Knitting Mode and got to work on a replacement with bulky yarn I had in the stash, using the same pattern as the original. 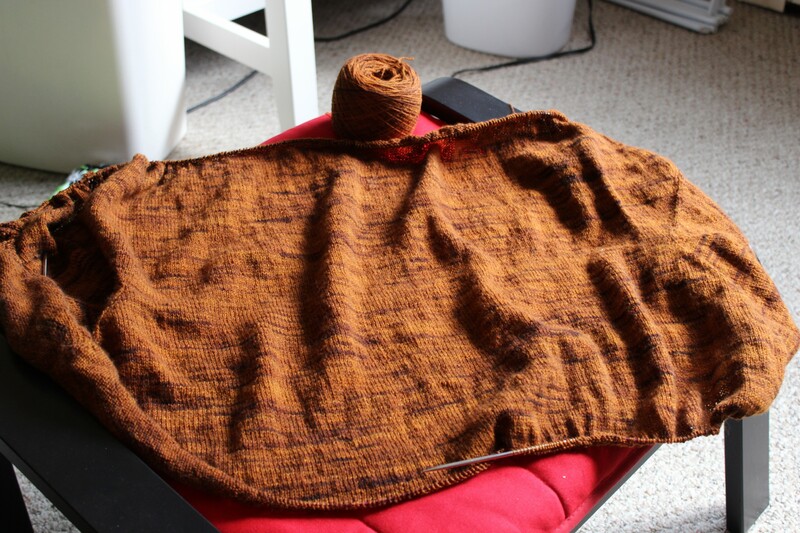 I put things on the back burner that probably should have been on the dinner table already to make progress – it’s a brioche pattern, so even this bulky knit was slow going. And then of course, he found his hat slipped behind some furniture at work where it didn’t really make sense for a hat to be. Now there’s this half-knit hat lying around, that I don’t love enough to finish but don’t hate enough to frog. Now that it’s not Emergency Knitting, I don’t have any passion for this project at all. What to do?